Nick and Jillian had their wedding and reception at the Foundry Suites in Buffalo. The reception was to directly follow the ceremony, so there was not much time at all for photos. The bride and groom did not want to do a first look either. They both got ready at the Foundry, so we could do a lot of bridesmaids and groomsmen portraits before the ceremony. Then after, we could concentrate on the whole bridal party and bride and groom. 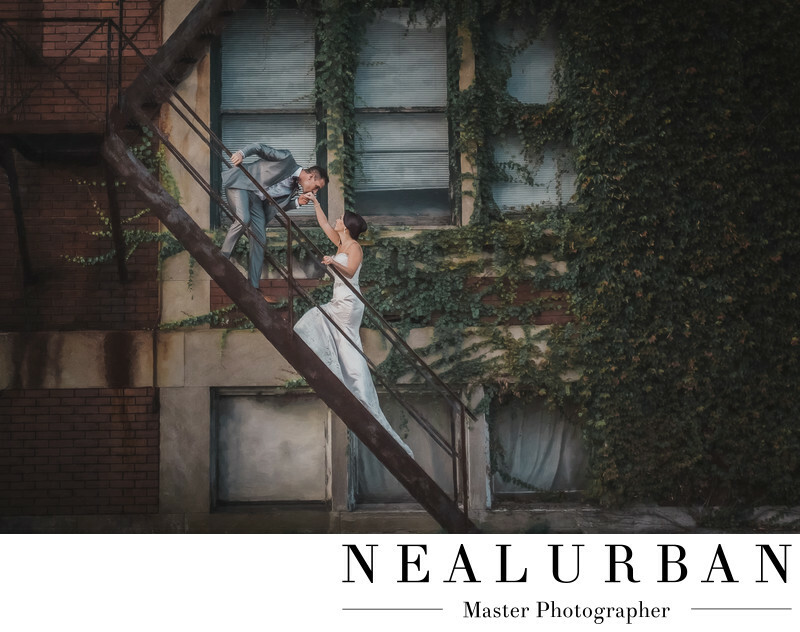 There was a location right across from the Foundry that Neal Urban thought would be really cool for photos. It was on the side of the Pierce Arrow Building. We found out the grooms brother and best man worked there, so we would be good to go! It was a Friday wedding, so the building was still open. There was a great fire escape on the side. We knew we wanted to use that for photos. We started with the whole wedding party, then sent them back to the Foundry to get ready for introductions. It was time to do photos with the bride and groom. When I first saw this location, I told Neal we were going to have Pretty Woman moment. Just like at the end of the movie. We had the groom go up the stairs and reach out for his wife's hand. Then go in for a kiss! We had the bride also up a few steps, so the train of her dress would hang down the stairs. We loved this location with the ivy all over the building. It looked so good with the rusted iron fire escape.Cars passing by were honking their horns and yelling out their congratulations to the happy couple. It was awesome! We did Nick and Jill's engagement photos around the corner at Delaware Park and Buffalo Japanese Gardens. They brought their dog Bentley. We love him! He was also the ring bearer for the wedding! Their engagement photos looked completely different than wedding day. Cherry Blossoms were in bloom for the engagement, so they got a lot of nature style photos. The wedding day was more architecture. It was a great contrast!! Location: 1685 Elmwood Ave. Buffalo, NY 14207 United States.